With so many choices eating in London can lead to difficult decisions. 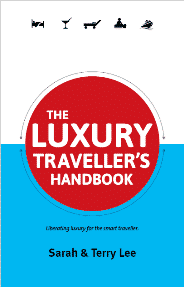 There’s the chic restaurants and brasseries, the cool pop up cafés and any number of chain eateries. But if you’re looking for something a little bit different head to one of these wacky but wonderful restaurants for the ultimate dining experience. Dans le Noir is not your average London restaurant. Diners are plummeted into complete darkness in order to explore a new world of sensation. They are also served by blind waiting staff. This dining experience allows guests to indulge in a surprise menu full of beautiful French cuisine whilst allowing guests to re-evaluate their perceptions of taste and smell. It serves a famous surprise menu created with the help of the chef Olivier Romain, and fine wines selected by their blind tasting wine expert Christophe Garnier. Circus definitely combines the wacky with the wonderful. If you’re looking for a mesmerising experience when eating in London then this is the place for you. Located in lively Covent Garden, the restaurant at Circus offers exquisite Pan-Asian fine dining with a side order of circus performers. 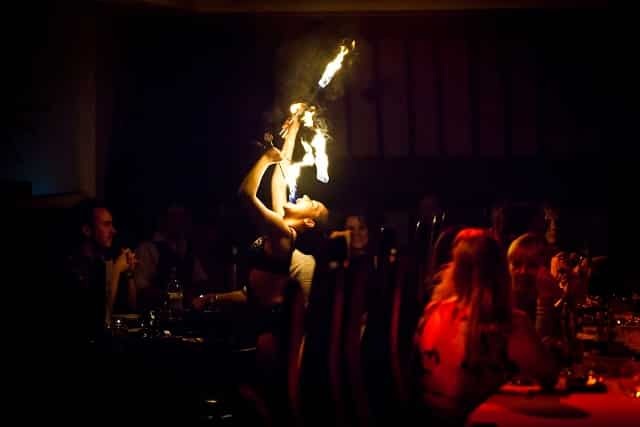 Indulge in some beautifully crafted food and marvel at your evening’s entertainment as fire eaters, trapeze artists and acrobats take centre stage. Escape from the bustling streets of London and take a trip into the rainforest to indulge in some tasty treats. 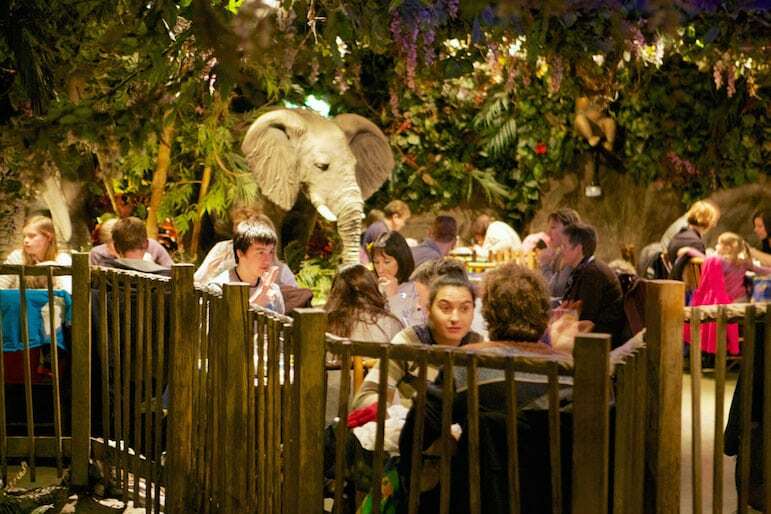 The Rainforest Café is a fun and exciting venue for eating in London with a jungle inspired menu featuring Leaping Lizard Mezze, Volcanic Chili Con Carne and Rasta Pasta. Located in the centre of London, The Rainforest Café’s vibrant jungle setting, waterfalls and animatronics will transport you to the heart of the jungle for a wild dining experience. Inamo is London’s first interactive restaurant combining the highest quality Pan-Asian cuisine with the best in new technology. Diners will find themselves in complete control of their dining experience. They can view projections of their food before ordering to help them decide which dish they’ll sample. It’s even possible to change the tablecloth to suit your mood and peer into the kitchen using the ‘Chef Cam’. 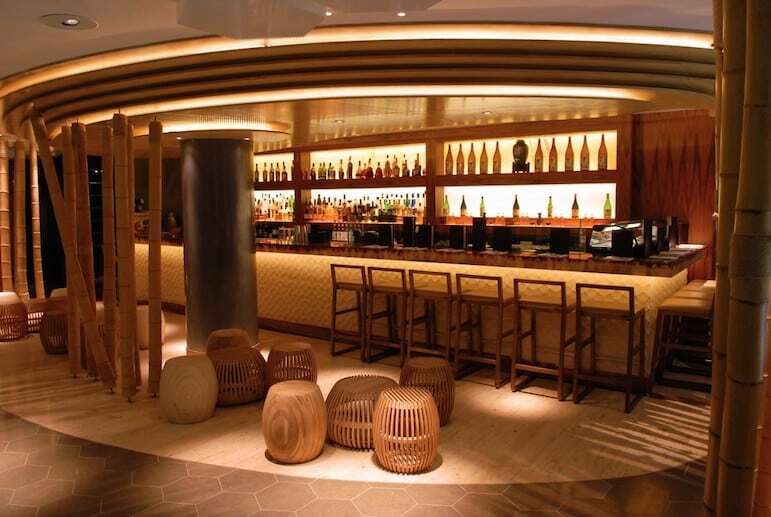 Inamo is the perfect place to experience a new concept of eating in London with indulgent food and tasty cocktails at your fingertips. 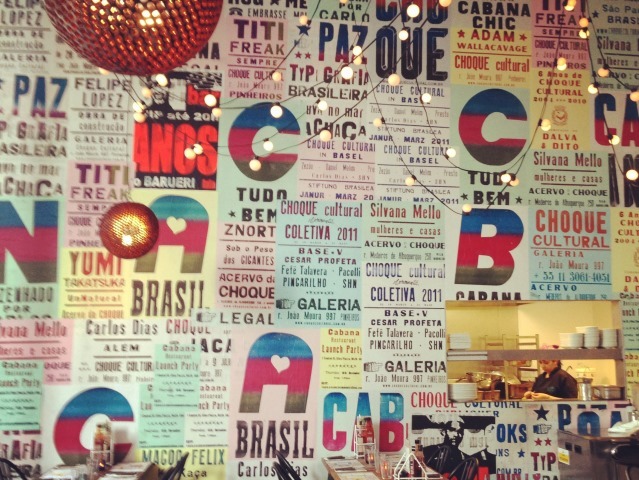 Cabana is the coolest place for eating in London and a great place to experience the best tastes of Brazil. The menu plays homage to traditional Brazilian cuisine showcasing perfectly spiced barbecued meats, satisfying street food and mouth-watering desserts. I highly recommend the peanut butter frozen yogurt, which is delicious. At the end of your meal, each diner is presented with a traditional wish ribbon – a Bahia Band. It’s a personal touch which really makes eating in London special. If flamboyance is what you’re after when eating in London you won’t be disappointed with Sarastro. Delicious Mediterranean dining meets extravagant operatic style at this vibrant restaurant. This quirky eatery is aptly located in the heart of London’s Theatreland and boasts an opulent interior. 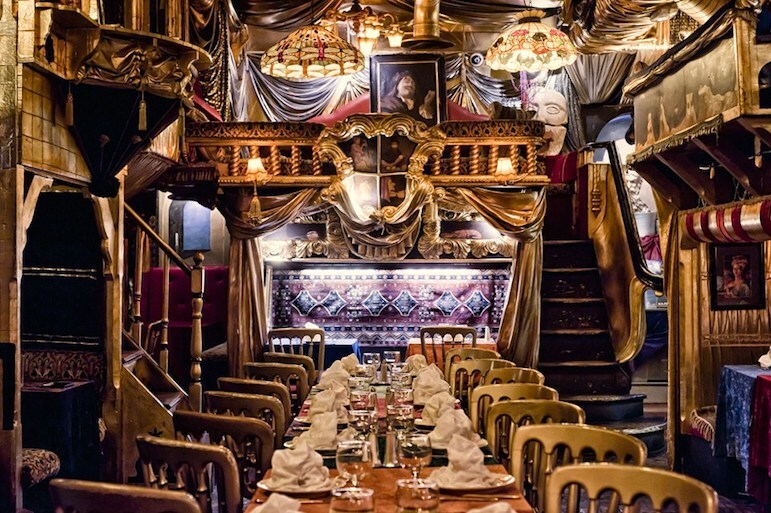 Sarastro is definitely a showstopper, with each table offering a different dramatic experience, so book a table or opt for one of their decadent opera boxes and prepare for the most dramatic dining experience of your life. Thank you so much for pinning this restaurant (Sarastro)> My sister and I ate here when we went to London several years ago and I could not remember the name. I hope it will still be there when I can go back- it was so great! Pleased you found it again Catherine, and thanks for following along on Pinterest!